There are some Yorkies that go against the ‘rule’ of being black and tan as a pup and blue and gold as an adult. One very rare, but possible instance is when a Yorkshire Terrier’s black remains black and his secondary color was always very dark and remains dark, most typically appearing to be red. This is known as a Red Legged Yorkshire Terrier and what this is and why this occurs is very interesting. What Does a Red Legged Yorkshire Terrier Look Like? 1. Black does not change to blue. The black portion of the coat is typically a very deep, dark, shiny black. It is the darkest black that one could imagine seeing on a dog. As the pup matures, the black will not change to blue. In fact, there is no hint of blue at all. 2. Tan or gold areas are red. The Yorkie will not have tan or gold. One of the most interesting elements about Red-legged Yorkies is that the secondary color will be a rich, shiny red. With many other breeds, red is the intensity that you achieve once an orange has crossed the borderline into red. 3. Coat may be wavier and/or wiry. You may notice more wave to the coat. The texture may not be quite a silky as typical Yorkies. Rather, there is more substance to the hairs; they are a bit denser and more structured. 4. Shorter hair length potential. Commonly, but not always, the coat of a Red Legged Yorkie will not grow out long as it would otherwise. For both red and black areas, a full-length floor-level coat may not be possible; a moderate puppy cut hairstyle will be possible. Yorkie (this is his name:), 3 years old, a bit over 2 lbs. What Causes Red Legged Yorkshire Terriers to Appear? True Red Legged Yorkies are 100% purebred Yorkies; in fact, they are this and are the embodiment of the breed's ancestors. First, we must remember that typically, a Yorkie (or any other breed for that matter) will most often acquire his appearance based on the parents (one generation back; sire and dam) however, it is fully expected to have physical traits going back 5 generations. Such things as size (both height and weight), bone structure, ear set, color and other traits are commonly expected to be hereditary for those 5 generations. This said, you cannot always expect this to happen. Every now and then, there is a genetic jump. This is also referred to as a ‘throwback’ gene or simply a ‘throwback’. This refers to a pup having traits that are much more in line with his long-ago ancestors. And this is where the Red Legged Yorkie comes in. While he does not meet the AKC standard and would not appear in show, he is very important in other ways, which we will discuss next. When you have a breed that is blue (as 99.99% of adult Yorkies are), this diluted coloring gene can lead to washed out coats. Black becomes dulled. Tans are creamier. The ‘true’ colors of the breed can start to appear faded. In addition, when you have a breed that has a silky coat, over generations the coat can become overly thin. So, what can you do to bring strong color back? And to improve coat texture? And while doing this, NOT introduce another breed? For quite a long time, serious breeders (at least those who know about red legged Yorkshire Terriers) use this to add color and texture back into the bloodlines. A Red Legged Yorkshire Terrier can produce more Yorkies with red, so those offspring should not be bred. However, that one introduction into the program can bring strong coloring and quality textured hairs into future litters. 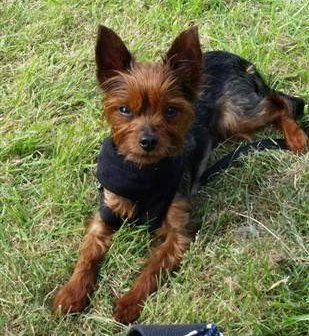 As you can see from these photos, Yorkies that stay black and have red are exceptionally beautiful and are a needed special type of Yorkies that will be beneficial to the breed as whole. Yorkie as a pup; his 'red' was more of a dark golden and has reddened as he matured into the adult that he is today. Q: I think that I have a red legged Yorkie, but his parents have the typical coloring. Can that happen? A: Yes, and it is very common. This is a random gene skip; the pup did not receive his coloring from his parents or most likely not even his grandparents or great-grandparents; this comes from many generations back. 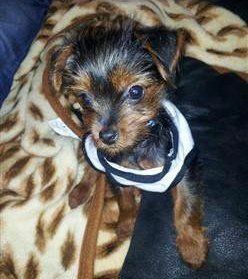 Q: Would a breeder know if a Yorkie was a red legged Yorkie before someone bought the puppy? A: Yes, and no. A trained breeder who has seen this before should be able to see the signs. While all pups have dark black hair, the ‘gold’ sections will often be darker, shinier and with a red tint. This said, some red legged Yorkshire Terriers grow into the red. They may not reach the ‘peak’ of this until the 12 or even 18-month mark. The other element of coat texture will also be picked up by a trained eye in most, but not all instances. The element of the coat not growing long would, of course, not be able to be noticed. Q: Is a red legged Yorkshire Terrier a purebred? A: While an introduction of another breed could certainly offset coloring, if you have an AKC registered Yorkie with proven lineage, then yes, he is a purebred. Q: Are red legged Yorkies excluded from show? A: While this super unique coat is a known and important factor with the breed, this is not an accepted color. The dog can be registered, of course. The red and black would be a major fault in show; so he would not be found in a show ring. Q: How often should red legged Yorkies be added into a breeding program? A: Sparingly. And many breeders do not implement this. Those that do, will perhaps do so once or twice in their breeding career. Enough breeders around the world know about this tactic and enough seem to avoid it, so that it is not done too often. If this were done too much, it would lead to an abundance of Yorkies that could/should not be bred and far too many that did not meet the standard. The oath of breeding is to do so for the betterment of the breed. Introducing a red to improve color and texture is a fine art; it must be done so only when applicable and only when color has really washed out of a bloodline. Fully Tan Yorkies with No Black - While very rare, this can be seen now and then. Which Type of Bones Can You Give to a Yorkie - Are you curious if this tiny toy breed can be given bones. What is safe and what is not. How Smart are Yorkies - Ranking of this breed in intelligence, compared to all other dog breeds and also compared to us humans. 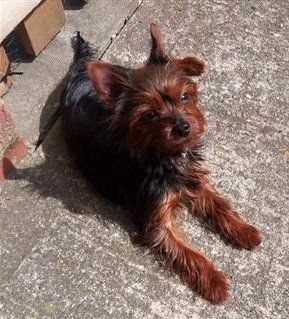 Yorkie Summer Care - Guidelines to follow when the sun is strong and the weather is hot. How Much Water Does a Yorkie Need - Water requirements for all ages and during all types of weather.